Even as the Majlis-e-Ittehadul Muslimeen, the Muslim political party with tremendous clout in Hyderabad, still keeping its cards on Telangana issue close to its chest, several other Muslim organisations have become active in support of the Telangana state. Though Muslims in Hyderabad's old city, the bastions of the MIM are largely silent and aloof from the one month long agitation for Telangana state, the minority community members were participating in large numbers in protests and processions in other nine Telangana districts. As the well established organisations like Jamat-e-Islami have declared their full support to Telangana on the grounds that smaller states will be helpful in providing good governance, several other Muslim groups like Muslim Forum for Telangana and Telangana Muslim Front have also come up to spearhead the movement. The issue of Muslim participation in Telangana movement has always been sensitive and crucial as they constitute nearly 20 per cent of the four crore population of the region and were mostly concentrated in Hyderabad and other urban centers like Nizamabad, Kamareddy, Warangal, Karimnagar, Adilabad and Nalgonda. Abdul Rahman Al Attas, the former Telangana Rashtra Samithi member of Legislative Council sought to dispel the impression that Muslims as a community were opposed to Telangana state. "This is untrue. Muslims like the other people of Telangana region want Telangana state as their rights will be more secure and they will get back their due share in government jobs," he said. He said that a Muslim Minority Joint Action Committee on Telangana was leaving for New Delhi on Saturday to meet Union home minister P Chidambaram , finance minister Pranab Mukherji and other senior leaders to spell out the stand of Muslims in favour of Telangana. The MIM, which has one seat in Lok Sabha and seven in the state assembly, is among the eight recognised political parties of the state invited for the January 5 talks by the Central government. "We will not come out with our stand in the very first meeting as it will be a prolonged process," said the MIM president and Member of Parliament Asaduddin Owaisi . Even as nearly 90 legislators of different political parties in Telangana region announced their resignations to mount pressure on the Central government to form the state, MIM has kept silent and the party has made no such announcement. 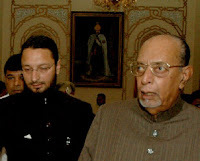 MIM has traditionally been opposed to the division of Andhra Pradesh and formation of Telangana state on the ground that separate Telangana state will be more fertile ground for the Bharatiya Janata Party and other 'communal forces' and the people from Andhra and Raayalseema regions were 'more secular' than those of Telangana. "If Telangana is formed, politically it will be beneficial for my party as it can win 15 to 20 seats in a 119 member assembly. But we are not looking at the issue from the angle of political benefit. We feel that it will not be in the interest of Muslim minority. BJP can never think of coming to power in an integrated Andhra Pradesh but they will have a chance in separate Telangana," Owaisi had said a few months ago. "We are neither for Telangana state nor for a united Andhra Pradesh. We are just saying that when they sit for discussion to decide the fate of the state, MIM should have chair at the table and Muslims as a stakeholders should be heard," he had said. But with the mounting pressure on the Central government from pro-Telangana forces and inclination in the Centre to positively consider the demand, the MIM is a bit worried about the future. 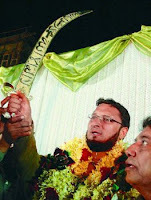 Jamat-e-Islami Hind's Amir chief of Andhra Pradesh Malik Moatasim Khan declaring Jamat's support to Telangana movement dismissed the fear of communal forces becoming communally strong and said that the communal forces were present all over the country and Jamat along with other forces will fight against them. "The issue now is not that of creating political consensus on formation of Telangana. But now the time has come to think of the development of the Telangana state," he said, adding that the Central government does not have any option but to form Telangana state. Movement for Peace and Justice, another active organisation, has come out in its support and said Telangana state should be formed on the basis of justice.